The Man Who Killed Houdini by Don Bell is a definitive investigation into the events that occurred in Harry Houdini's dressing room on Oct 22, 1926, and the man at the center of the fatal "attack," J. Gordon Whitehead. It is a remarkable work that will blow the minds of Houdini enthusiasts and magic historians. 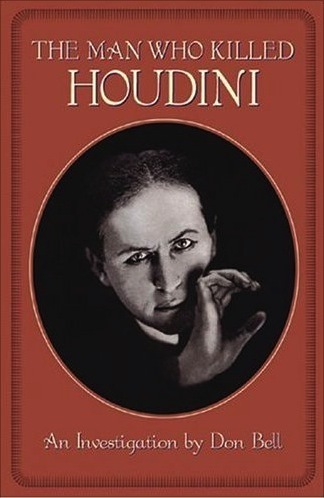 Within the first few chapters, Bell rewrites Houdini history by discovering that the magician was attacked (or at least "tested") three separate times during that fateful week in Montréal. A native of Montréal, Bell finds independent eyewitnesses to each of these other, non-lethal punches. It's a stunning discovery. Unfortunately, Bell doesn't investigate these other incidents in detail, but remains focused on the final famous dressing room attack by J. Gordon Whitehead. Bell's hypothesis is that Whitehead may have been acting as an agent for spiritualists. Considering Houdini's vehement anti-spiritualist crusade, this is not a far-fetched theory. Trouble is, absolutely nothing is known about J. Gordan Whitehead (and some have even questioned whether or not he even existed). It's Bell's search for the phantom Whitehead (which takes up a good middle of the book) that presents my only criticism with the book. Bell describes in detail every step of his 20 year investigation, including his many false leads. Okay, dramatizing a few false lead is entertaining and adds to the detective story (not to mention makes the eventual discoveries all that more exciting), but Bell relates EVERY false lead, devoting whole chapters to lines of inquiry that never pan out. This does becomes a bit tiresome after a while. However, when Bell finally gets on the right scent and starts uncovering the life and death of "the man who killed Houdini", the book again becomes fascinating. I won't spoil it, but somehow J. Gordon Whitehead turns out to be both a complete surprise and exactly what we would expect. Bell also tracks down the elusive eyewitnesses to the dressing room incident, Jack Price and Sam Smiley. Thank goodness Bell did this investigation when he did, as most of these key players are now deceased (as is the author himself). In the end, Bell is never able to pin a conspiracy on spiritualists, nor link Whitehead to the movement. There is also a nagging feeling that there is still something untold in all this. But in this age of sensationalized conspiracy theories as entertainment, it's refreshing to finally get book that admits the truth of its own findings (even though this tends to relegate them to smaller publishers, as is the case here). But this honesty also legitimizes this book as a real investigation by a real investigator. And what Bell delivers in The Man Who Killed Houdini is far more interesting than any conspiracy, and of much greater value to the serious scholar of Houdini and magic history. This book is a must. The Man Who Killed Houdini is out now in Canada. It will be released in the U.S. on September 28, 2005 and can be purchased at Amazon.com. 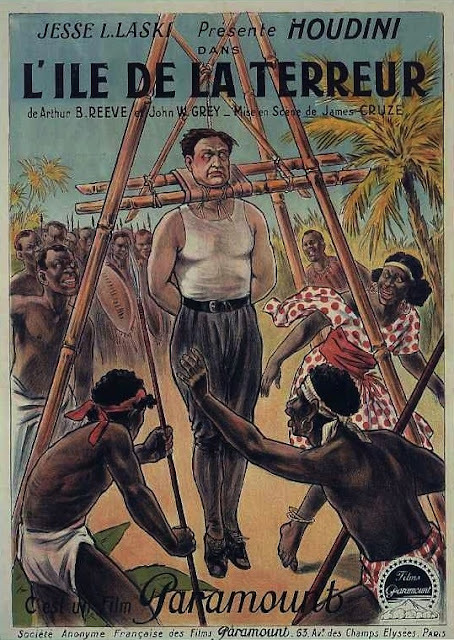 A rare French color lithograph for Houdini's second feature film, Terror Island (1920), is going to be auctioned by Christies's auction house as part of their Christian Fechner Collection of American & English Magic, Part I. The poster is reported to be the only known copy. The auction will be held on October 27, 2005. The estimate is $12,000/18,000. UPDATE: The poster sold for $12,650.